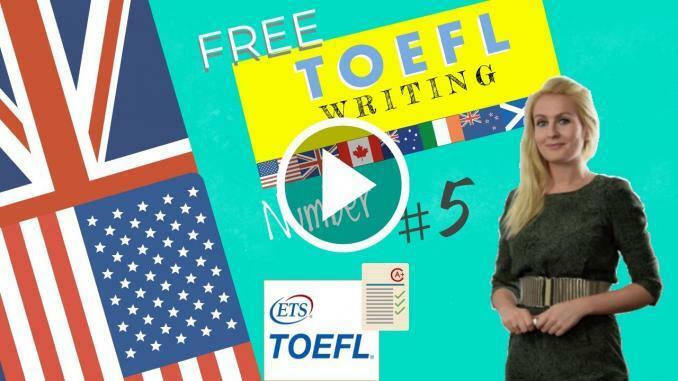 In this lesson we will look at the TOEFL WRITING Section and more particularly Giving opinion. In this guide you’ll learn how give your opinion so as to answer TOEFL writing section questions in order to score maximum points. This type of question is very similar to agree/disagree questions. The question states two opposite views and asks you to give your opinion. how to write a high quality essay that clearly states your opinion. Some people believe that violence on television and in computer games has a damaging effect on the society. Others deny that these factors have any significant influence on people’s behaviour. What is your opinion? Choose your opinion & generate arguments. First of all, you need to take sides and chose from the two opinions offered. Then, you have to think of your arguments for the chosen opinion. For our essay, we’ll choose the second opinion. How to answer this task? These days, the amount of violence in the media is great and it is still growing. While some people argue that this trend will undoubtedly lead humans being exposed to actual violence, others claim that it has no real effect on the actions of people in society. I believe the latter that in most cases media violence doesn’t affect people’s behavior. Firstly, I think that people act for deeper motives that depend of physical states and environmental factors, regardless what they see on the television. That is to say, if someone becomes violent it is not due , to watching TV or playing computer games, but due to that person’s character and education or some real event. Although it is generally considered that violence in the media accustoms viewers to it, I do no subscribe to this view . I think reasonable, and intelligent people act humanely irrespective of what they see or hear on the television. Moreover,according to some video games and television are away to channel social aggression by providing a safe outlet for it. In other words, wannabe killers and bullies can fight in virtual reality instead of dragging innocent parties into their sick world. This is perhaps a great safety valve and that it could reduce violence overall. Personally I have never encountered any manifestations of antisocial behaviour resulting from a social media experience. Taking everything into consideration, I would say that there was no real evidence that violence in contemporary media has had a substantial influence on people’s violent tendencies. Television and computers are not the main factors that cause people to snap or to premeditate vicious acts. Moreover, according to some video games and television are away to channel social aggression by providing a safe outlet for it. In other words, wannabe killers and bullies can fight in virtual reality instead of dragging innocent parties into their sick world. This is perhaps a great safety valve and that it could reduce violence overall. Example: A lot of wild animals are endangered. Evidence for this is proved by decreasing number of species. Example: Overall, no parents should neglect their children. Tips on how to answer the toefl writing section. August 8, 2018 Comments Off on Toefl listening sample including a full transcript with questions 3. March 17, 2018 Comments Off on The verb to get in English Beginners Course Lesson 25.